1 Preheat oven to 425°F. Coat a large rimmed baking sheet with cooking spray. 2 Mix maple syrup, butter, chili powder and salt in a large bowl. Add squash and shallots and toss to evenly coat. Arrange in a single layer on the prepared baking sheet. 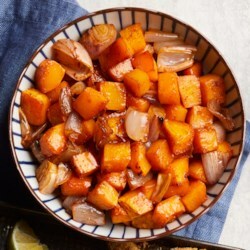 3 Roast the vegetables, stirring once or twice, until tender, 25 to 30 minutes. Drizzle with vinegar before serving.